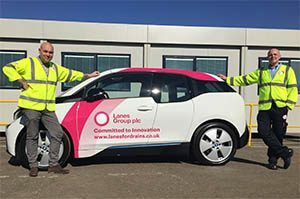 The electric car, sporting eye-catching Lanes livery, has been contract hired by Lanes Scotland, for use in and around Glasgow. A second car is on order to operate in Edinburgh. Lanes Scotland Director Kevin Moon said: “We believe this is the first example of a drainage contractor using an electric car operationally, certainly in Scotland, and maybe in the UK. “We want our services to be as sustainable as possible, and reducing the carbon footprint within supply chains is certainly a key concern of many of our clients. Lanes Group, the UK’s largest independent drainage specialist, operates three depots in Scotland, in Glasgow, Edinburgh and Aberdeen. The BMW i3 has a range of 120 miles on one charge, with a back-up petrol engine that extends the range for a further 80 miles, if it is needed. It will be used by Lanes Operations Supervisor Andy McCormack to carry out a range of duties, including visiting worksites to scope, risk assess and audit projects, as well delivering additional materials and tools. Kevin Moon said: “We expect the i3 to be truly sustainable, as it reduces our carbon footprint and will save us money on fuel and road tax costs, allowing us to make our services even more cost-effective. “We have a large fleet of specialist drainage vehicles, so we are acutely aware of our need to take sustainability seriously. We need to always look at what we can do differently.